Try something new for lunch with our family-sized warm ham & cheese sandwich. The fresh bread loaf, loaded with ham, cheese, salad greens and tomatoes, is easier to prepare than individual sandwiches and feeds a crowd! Slice off top third of an Italian bread loaf, hollow out interior and spread Miracle Whip Dressing on bottom, sides and top. Layer loaf with 2 pkg. sliced ham and Singles Slices. Place loaf and top cut side up on cookie sheet. Bake in a preheated 400°F oven for 10 minutes or until cheese is melted. Top meat and cheese with mixed salad greens and sliced tomato. 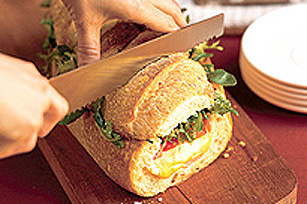 Replace bread top and cut into serving-size pieces with serrated knife.